Happy Kitchen Sink Stamps Monday, thanks for stopping by today! I hope you enjoyed the long Thanksgiving weekend! Did you do any shopping, or are you waiting on some Cyber Monday Sales? I did a little shopping this weekend both Brick and Mortar and online, got some good deals and a little something for me too! Before I share the details on today's KSS post, I wanted to let those of you who use my KSS Discount Code know that there will be some slight changes to the code later this week - if you experience any issues using the code, please email me. I had a few pieces of Eskimo Kisses paper from Basic Grey in my paper stash, and thought they'd look lovely with the Kitchen Sink Stamps Multi Step Gift. I just happened to have some Pomegranate Card Stock and Ribbon left over, so that worked out just perfectly! The Gift was stamped to match the papers, I chose to add the Blue Ribbon, as there was just a bit of Blue on the larger panel. The Ribbon was tied using the Bow Easy, then I added a metal Star embellie with a Glue Dot. The Rustic Star has a bit of Pomegranate/Cranberry on it, to finish off the card, I lightly spritzed with Rangers Perfect Pearl Mist. Click here then enter code LISA10KSS at checkout to save 10% on all your purchases at Kitchen Sink Stamps. 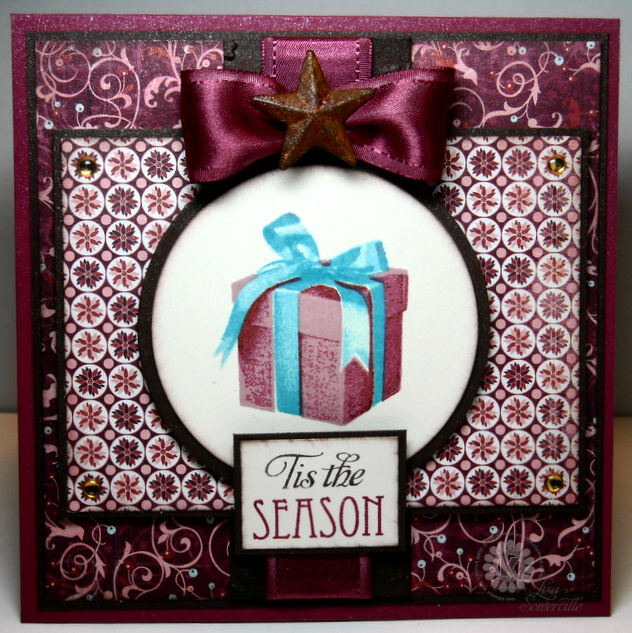 Gorgeous work, Lisa, with these rich colors and patterns!! Your gift is absolute perfection!! What a beautiful holiday card!! Beautiful rich colors and perfectly matched ribbon to paper with the coloring. Love the star accent. ;) Gorgeous card. mmmm such beautiful colorz, beautiful card. Lisa, this is so gorgeous!! I love the color combo...turquoise blue is so pretty! Beautiful card and colors! The gift package looks ready to be opened! Did not go out on Black Friday, but did on Sane Saturday and bought a new computer! Working out the kinks in it! gorgeous card, love the monochromatic colors with just the touch of turquoise on the ribbon. This is gorgeous, Lisa!! Thanks for joining us again at The Sweet Stop! Gorgeous card Lisa. Thank you for playing with Speedy's Friends. Wow, Lisa! This is just so beautiful! Love this sketch, and the colors you used are just so very rich! Hugs! Lisa I don't even know where to start this card is absolutely beautiful! Love the image the ribbon and star...sigh! Just Gorgeous girl! Thanks so much for joining Just Us Girls this week! WOW!!! Beautiful card and fabulous coloring!! Beautiful card and bow! Thanks for playing with Speedy's friends! 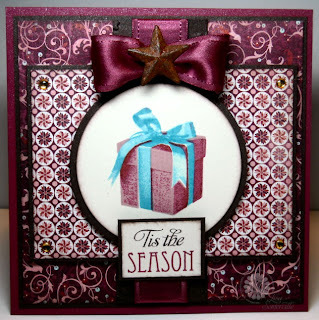 Beautiful card - the colors are so elegant and love the pretty bow! This is gorgeous - your coloring is amazing! Thanks for playing at The Sweet Stop! Gorgeous card, love that blue bow and your beautiful satin bow on top. Beautiful work. This is gorgeous! Love your rich, pomegranate color palette and the cute star embellishment in the center of your bow! Love the Deep Rich color of your card. Thanks fort playing with us again at The Sweet Stop!!! Such a rich creation Lisa. The colors are beautiful and the blue pops! I'm always excited to visit your blog and see your masterpieces. Thanks!